Imagine you trudge through the woods with your best friend. Together you build the most wonderful hideouts in the treetops. You swing on big lianas under cooling summer trees and let yourself splash in the river underneath. From branch to branch you chase the squirrels. In the evenings you tell each other stories of the treehouse spirit in cozy treetop tents and doze off under a weeping willow stroking your hair. 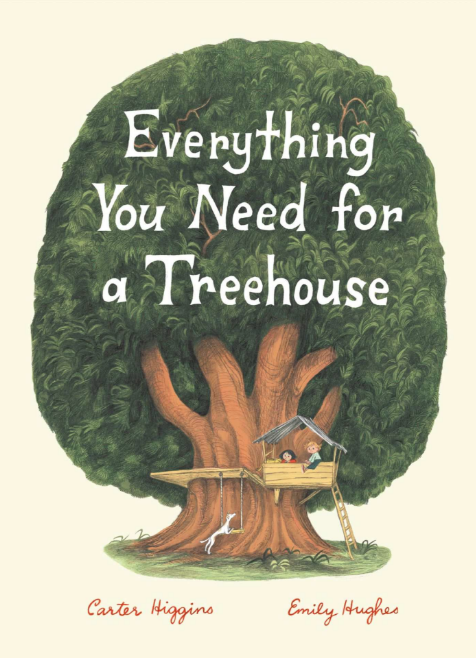 That’s what it feels like when you dive into the world of the fantastic children’s book „Everything You Need for a Treehouse“ by Carter Higgins and the brilliant illustrator Emily Hughes. The book was published April 2018 in english by Chronicle Books. In rhymes you learn everything you need, whether physically or spiritually, to build yourself a dreamtreehouse. From the treehouse in the birch forest, the treehouse library with reading cave to the pirate’s treehouseboat – Hughes lovingly designed and detailed illustrations guide you through a diverse treehouse landscape in various surroundings. What I particularly liked is that this is finally a book which doesn’t serve the usual gender stereotypes, but also doesn’t desperately try to dismantle them. Girls are shown as treehouse engineers here just like boys. During witching hour they protect smaller boys or they guard their coconut-loot as wild pirates in the hammock. How little human beings from all over the world are shown in numerous emotional facets is just beautiful. A very special children’s book with much humour and lightness. For those who don’t know Emily Hughes illustrations we also recommend „Wild“.